I'm in the food-raising business. What I produce feeds people in my community, and honestly, even though I try hard to keep the cost down, I'm not the cheapest food option. Price and food are something I think about quite a bit. So I'm reading a local newspaper article about food stamps being reduced, and the comments are just plain vicious; accusations of fraud, and lazy poor people, and all sorts of just plain meanness. Outright cruelty. Folks, think back about your interactions with people, and when you were impressed with someone. I'm going to guess that at least some of those interactions are where someone was generous to you. Gave you better measure than you expected; gave you something unexpected, went over the top for you for little or no gain on their part. "...In its secondary meaning, Hebrew mitzvah, as with English "commandment," refers to a moral deed performed as a religious duty. As such, the term mitzvah has also come to express an act of human kindness. The tertiary meaning of mitzvah also refers to the fulfillment of a mitzvah. ..."
The MAXIMUM food stamp benefit per person is $133/month, or $4.43 a day. Did you know that? Lets imagine that ALL food stamp recipients were fraudulent. Every single person getting food stamps is doing so illegally. Would that really be so bad? here's why I'm saying that: For the cost of a single bomb dropped in afganistan we could provide food stamps to 10,000 people. For the cost of a single month in afganistan we could provide food stamps to the ENTIRE US POPULATION for a YEAR! Don't get me started about oil company subsidies, or that Apple (the smartphone company) paid either zero taxes on billions of dollars of income or very, very little. Like 2%. And if by chance some child didn't go hungry, or some working poor person was able to buy themselves a chocolate milk and an apple... are we as a country so poor that we'd begrudge them that? Look, if you're earning minimum wage somewhere, brother have a cookie on me. Honestly. I'm right there for that. This is my mitzvah; my tax dollars going to feed people, and give them something that their employer didn't. That their family didn't. That they wouldn't get any other way, because, honestly, most of these folks are scrabbling as hard as they know how, and if it's fraud, well so be it. Most people who get food stamps are living an existance that most of us cannot imagine. They probably don't read this blog because an internet connection is a luxury that they don't have, much less a smartphone. Take a minute and figure out how far that $4.43 would go for you today. And think about America, one of the richest countries on earth, were we begrudge even that little tiny bit of government/institutional generosity. Folks, lets make america somewhere where we are kind to our least, our smallest, our poorest, and our lazy. "The quality of mercy is not strained.It droppeth as the gentle rain from heavenUpon the place beneath. It is twice blessed:It blesseth him that gives and him that takes. I've been working hard on the farm for the last 6 months; and it's been quite the project. 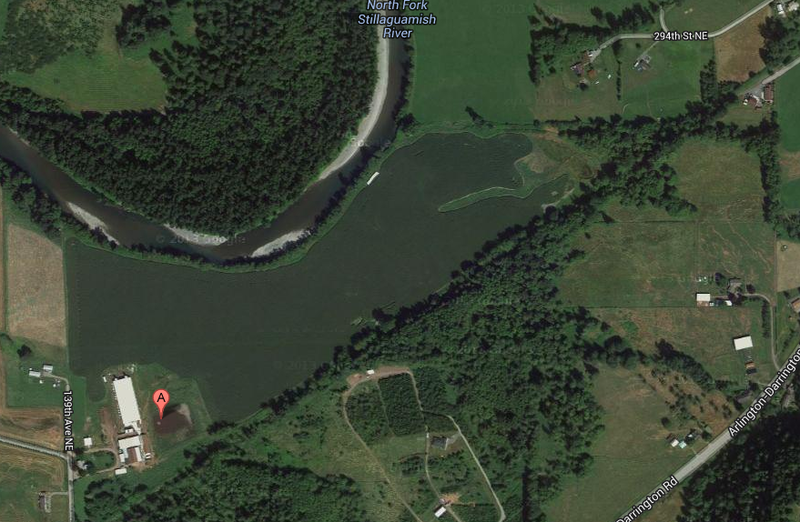 This is an aerial view of my farm, with the house and barns in the lower left corner, to the east of the "a". This particular picture is a couple of years old, but it's the latest that google maps has. In this picture most of the land is planted in corn; I'm going to guess that this is probably August. 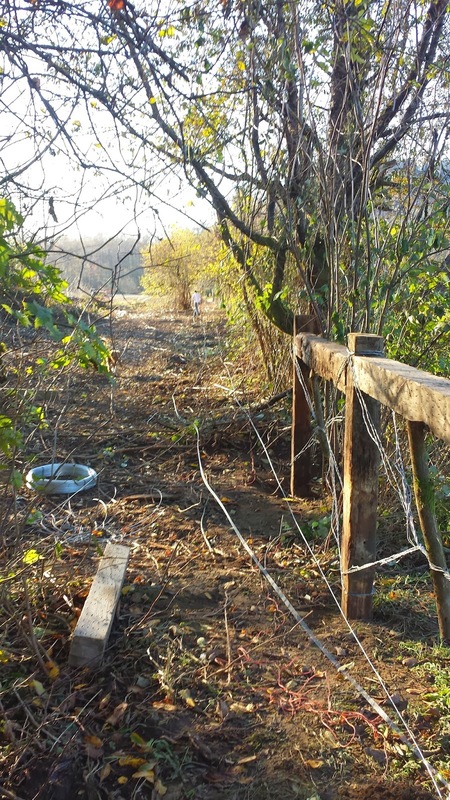 What I've been working on is the fence along the north property line. That's marked in red in the photo above. From this distance it looks pretty small, but it's actually a pretty big distance. What happened on this farm for the last 50 or 60 years is that someone would go out every 10 years or so and look at the fence line and think "man, this area needs a fence" and they'd build one. and then another 10 years would go by, and the blackberries and bushes would cover that fence, and then someone else would look at it and say "man, this area needs a fence" and they'd build one. 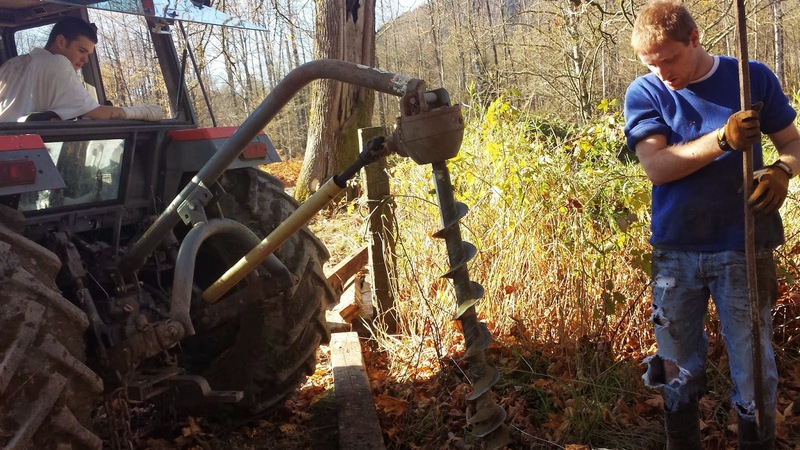 With my survey in hand, I started clearing along the property line so that I could run a fence, and also so that I could reclaim about 5 acres of land that got covered by blackberries. If you look carefully in the picture above, you'll see Taylor walking a high-tensile wire to the brace at the other end of this span. It's about 1300' for this particular run, and you really can't see the far end. it's just too far. For reference I've put a blue dot were I took this photo from, and I'm facing west. There are three property owners along that property line. I haven't heard from one of them, but the other two were very concerned when I began to clear the property line, preparing to fence. Which was a bit of a surprise, actually, and it took a few days and some phone calls and in-person meetings to smooth things over. Basically their concern was that I was fencing in the correct place, and that I wasn't trying to do some sort of land-grab. My survey helped, and also the department of natural resources monument (survey marker) that had been put there a long time ago and they all knew about. So unlike other property lines there wasn't much controversy about where the property line was, or who owned what. I put a gate in the fence for each of the property owners in question. Which may seem odd, but I think that while fences make good neighbors, a fence with a gate makes an even better one. When you have livestock, no matter how good your fences or intentions are, you're going to have a day where your critters get out. Maybe a tree knocks your fence flat, or someone leaves a gate open, or maybe you have a cow genius that figures out how to defeat it, it's going to happen. Having a gate for each property allows me to quickly retrieve any livestock that ends up on their property. It also helps to concentrate access to your property; people tend to use the gate, and so if there is a security concern, you can focus on the gate area instead of trying to secure the entire property line. I had an object lesson on this yesterday. While I had the old barbed wire fences down, my cows did get out, and did make it about a half-mile onto a neighbors property. It took 2 hours to chase them down and convince them to return. I'm looking forward to completing the fence and knowing that it's secure. Here's what I've fenced so far in red, and where a neighbors fence is suitable in blue. Um, "suitable" - means that there is a fence there that will do for a while, but I'll probably run a better fence against it next year. The river has a relatively high bank, so I don't have an immediate plan to fence it, but will do so before I run grazers on the new forage I planted. The next stretch I fence will be along the south property line, extending the diagonal line near the house and barns to the back corner of the property. That's a little over twice the distance that I just fenced, but it's easier terrain. The high-tensile fence really lends itself to large fence spans. 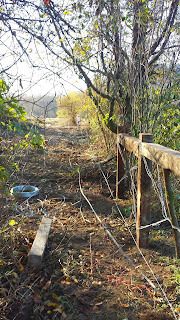 It is much easier to construct than barbed wire, mostly because you can walk the smooth wire from the spool to the far end of the fence; it just slips through and doesn't usually catch on anything. Barbed wire means that I usually have to carry the (100lb) spool to the far end, which is much, much harder. Line post spacing is random, usually based on terrain. I'll do a post about high tensile fencing later this week. Government visits... They just don't get it sometimes. I received a letter from the Snohomish county department of health from my old friend, Kathy Pierson. I've dealt with her before, but it's been a while. Unfortunately, she's coming to me with the very same complaint that she originally was investigating. One of of my neighbors called in a complaint to the Health Department and complained that I was feeding my pigs fish. 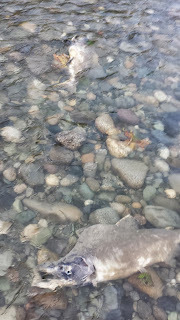 There is a very strong odor of rotting fish along the river right now, caused by the thousands of pink salmon that are decomposing on the banks, and I do find fish on my property from time to time, but I don't as a rule make a practice of feeding fish to my pigs. I have done it in the past but after researching it and the regulations, I don't now. Which is a shame, actually. The fish that I am able to get is high-quality, human-grade food that didn't make it into the store for one reason or another. It's a real crying shame to see the high-protein food get wasted. So one day I got back to my house and there was an an envelope taped to my front door, with the SnoCo health department welcome materials in it. How to control rats, some stuff about regulations,and a letter stating that they'd recieved a complaint. In addition to the health deparment material there was also a card and materials from Dr. Amber Itle, Field veterinarian with the washington state department of agriculture. With Kathy I'm going to just say that trying to educate her on normal farming practices seems like a complete waste of time. Last time I finally had to just flat-out state to her that if she believed I was breaking a rule, regulation or law that she was encouraged to charge me with that violation and I'd see her in court; after doing that I didn't hear another word from her until now, a year later. But Dr. Itle is a different matter. My farm has already been inspected by the State Veterinarian and my feeding practices and the materials I feed were deemed perfectly appropriate. 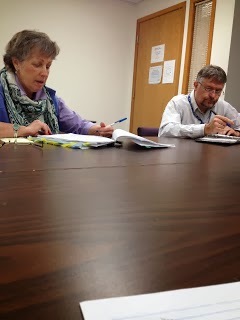 I called Dr. Itle and she confirmed that feeding fruits, vegetables, dairy and bakery items were fine with the state vet. She suggested that I feed my animals on concrete slabs (which I've been doing since Feb 2012) and we talked about my operation. 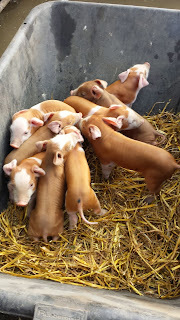 I explained that I feed my pigs a base ration of feed purchased from a local mill, and that I supplement that feed with food that we get from a variety of sources. Most recently, for instance, I have been feeding 400lb drums of triple berry blend, which smells a lot like the fruit smoothies that costco sells, and the pigs love. I explained to Dr. Itle that the fruits-and-vegetables and recycled food is actually about 30% of my feed regiment right now; and that I actually have to work very hard to collect the food and bring it here. 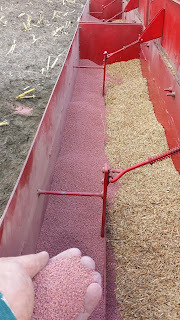 I'll contrast that to the feed mill that will cheerfully mix and deliver 6 tons of feed anytime I want. Since the recycled food comes in different packages, it's actually harder to feed than, ah, feed. The triple berry mix comes in 55 gallon drums and pouring out a 400lb drum is no simple task to do safely. Every kind of food we get is packaged differently, some easy to deal with, some more difficult, and the availability is random. So I keep feed on hand to make sure every animal is getting what they need. Dr. Itle pointed out that I could feed whatever I wanted if I just got a $10/year license from the state; a "garbage feeding" license would allow me accept meat, fish and any other type of recycled food, cook it at a rolling boil for 30 minutes, and feed the resulting soup to the pigs. I agreed with her, but told her that despite there being all sorts of food being wasted right now that would be great for pigs, the required equipment to cook food to their standards made it cost-prohibitive to do. She countered me and said that there were licensees all over washington, mostly in eastern washington, and that I should consider a license. I replied that if it was economic to do that there would be many people licensed, but I didn't think that anyone was. She was sure there was. I was skeptical, but she is the regulatory agency for this particular license, so I put in a public disclosure request for every licensed garbage-feeding operation in washington state. 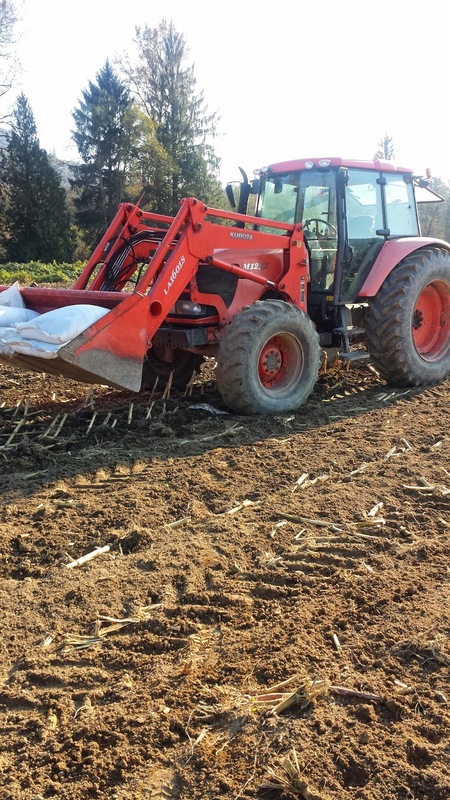 There is precisely one farm in washington state that is currently licensed for garbage feeding. Now I'm going to point out that Cedar Grove Composting takes in hundreds of thousands of tons of food waste and composts it on their facility. And their facility has been cited, fined and complained about for years. They get sued because people believe them to be the cause of a terrible odor. So back to Dr. Itle; I told her that I feed the foods that I do out of a believe, sincere belief, that getting the highest-and-best use out of food is to use it AS FOOD. I'm going to compost it too, I'm just going to put it through a pig first. And by doing so raise more food. I think that using food makes the food that we waste as a society a little less of a sin. Not much less, but a little less. I wasn't able to convince Dr. Itle, but I think I did get it across to her that sometimes you have to be willing to risk and push back when you run across a rule, regulation or situation that you disagree with. 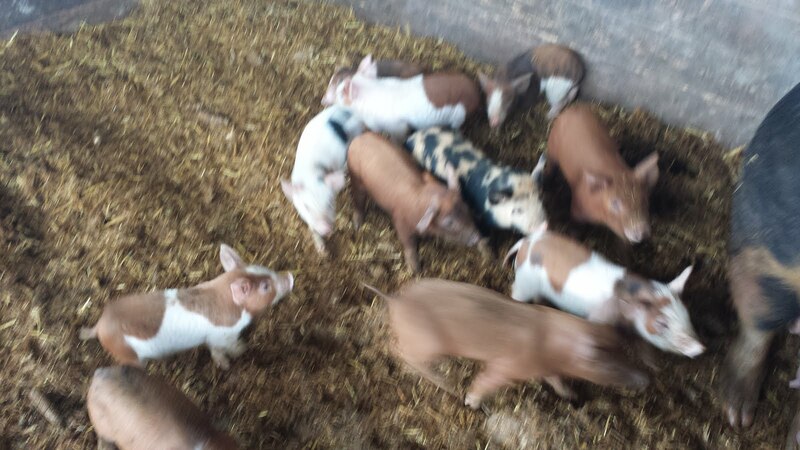 Took a wheelbarrow over to retrieve the piglets from Dale, my special neighbor today. They're cute; good sized litter of 9, all healthy and bouncing. Dale isn't speaking to me, but got to meet her Son, who seems to be a pretty reasonable guy. 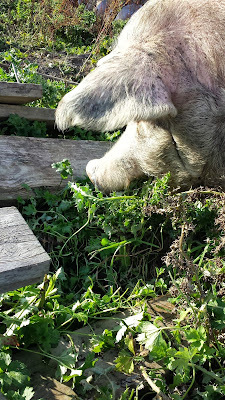 Got the pigs tucked away in the barn, and was out working on an implement near the tractor when I noticed a pig eating thistle plants. I would have thought that thistles would be the last thing a pig would eat; they're jagged and thorny and to me look completely unappetizing, but this pig (and several others) were working their way through a thistle patch, eating the entire plant, root, stem and leaves. I've got a couple of patches of thistles on the edge of the field. I've been eradicating it as I work around the edges of the property, mostly while fencing, but it's nice to know the pigs are helping. 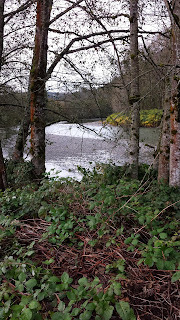 There's a bunch of eagles that have been eating the spawned-out salmon on the river. 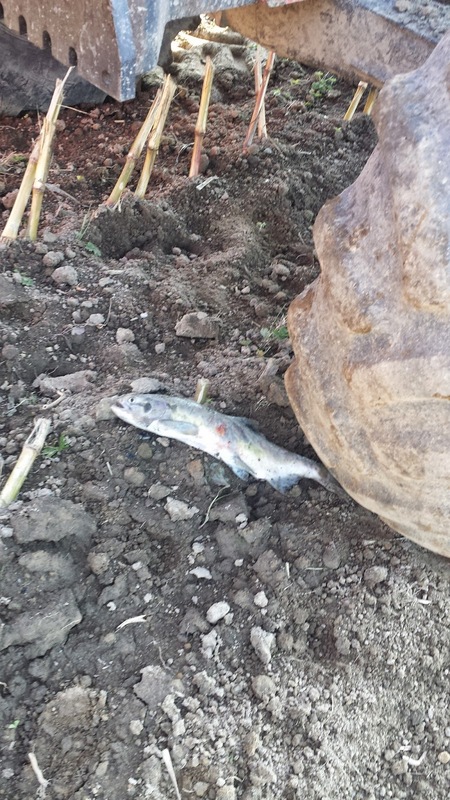 One of them was carrying this salmon across my field when it was harassed by a bunch of crows. 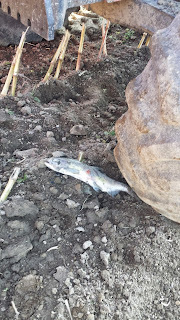 The eagle dropped the salmon. 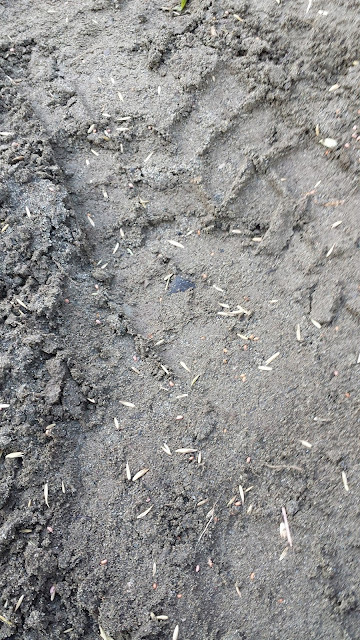 I saw the crows as I was seeding, but didn't know what they were doing. After the seeder ran over the salmon the crows made pretty quick work of it. I couldn't get a picture of the flock of crows; they were pretty shy. I'm interested in what will grow well in my soil and microclimate, and I'm interested in knowing what works the best as far as amount of seed applied per acre, and mixtures of seeds. So I'm planting 50 or so acres with a variety of seeds and rates, so that next May I'll be able to look at the results and see what works best. 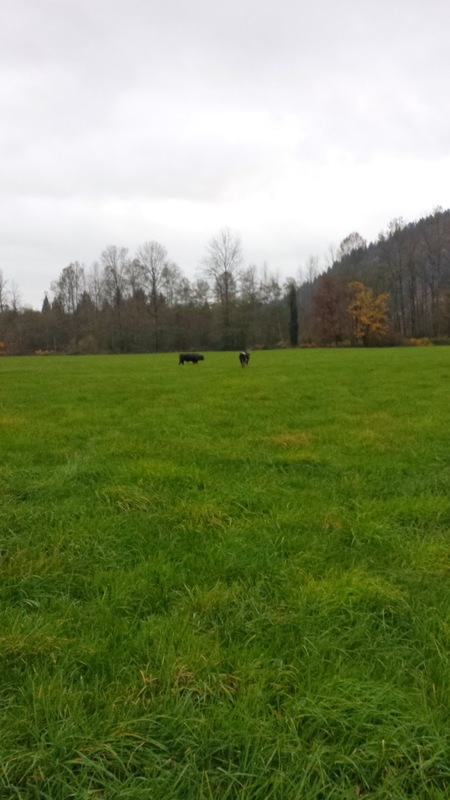 My long-term goal is to come up with a good pasture mix that provides excellent forage for the animal I raise. 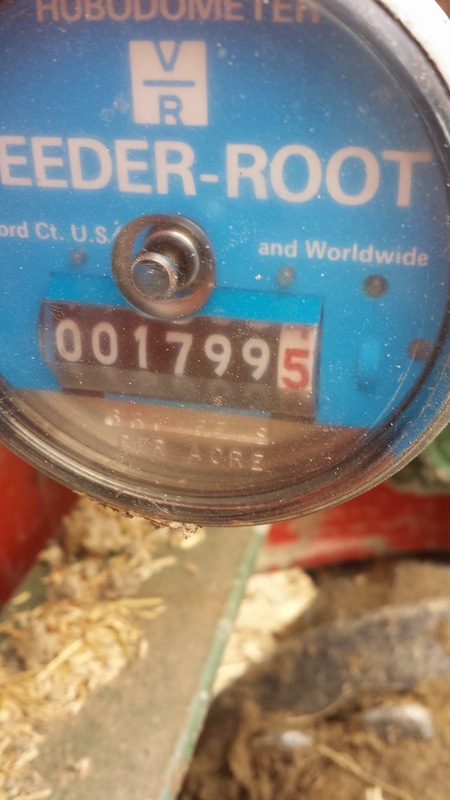 The gauge in the picture at the start of this post is the acre-meter for the brillion sure-stand SS1201 seeder I purchased earlier this year. 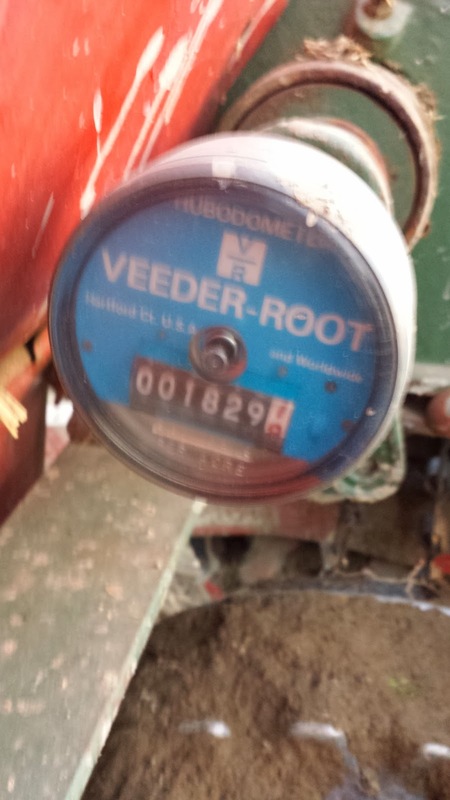 I don't know how old it is, but it's apparently planted at least 1800 acres since the meter was replaced, and so this is where I start. 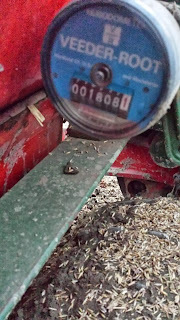 It took me a couple of hours to figure out how to calibrate the flow of seeds, and I had to repair a couple of things. The biggest thing that I did was download the assembly manual and go through it very very carefully. 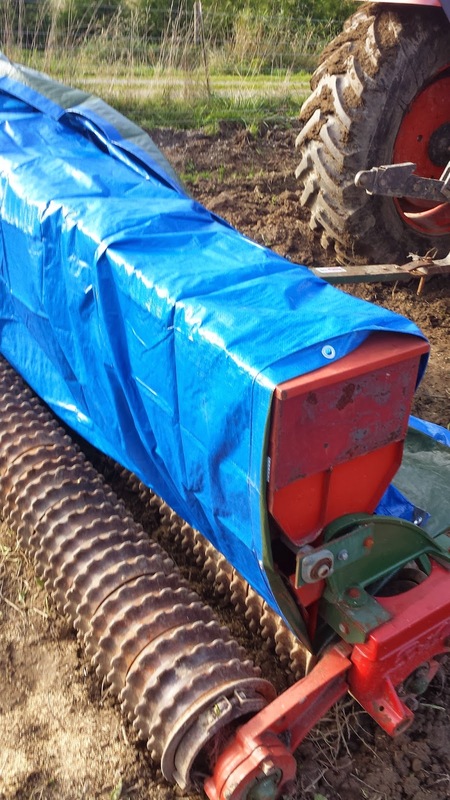 I carefully followed the instructions and adjusted the seed handing stuff, and replaced a bearing, and then lubricated everything that called for it, and then put the tarp on it and pulled it to see how close the estimated seed rate was to the actual seed rate. In the picture above, the grass seed is the rice-looking long thin things, and the alfalfa seed are the pale pinker looking tiny seeds. 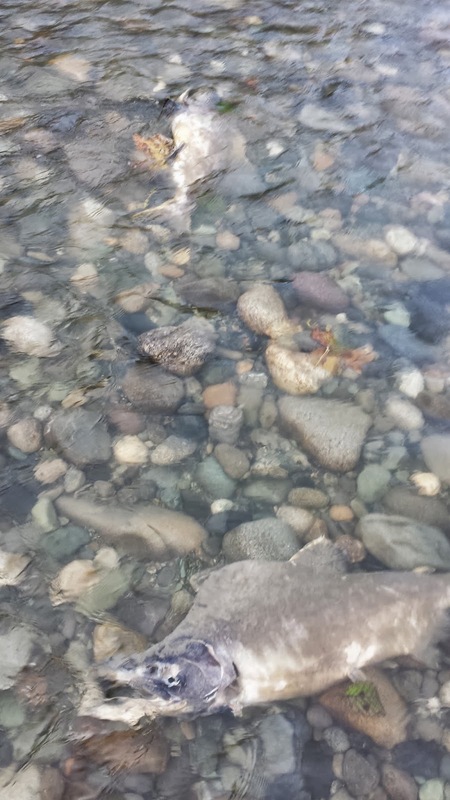 Find the small black rock in the middle of the photo. there's a grass seed immediately left of it, and an alfalfa seed a little to the right and above it. There are 31 alfalfa seeds in that picture. The tracks left by the tractor tires compress the dirt so that the packing wheels of the brillion don't push the seed down, which is annoying, but it allows me to verify that the seeds are actually being deposited. for the first hour or so I'd run 600' (about 1/5th of an acre) and then get out and look in the seed boxes and carefully study the ground behind. A couple of the seed outlets were blocked, but after a while I was pretty confident that I was actually getting good coverage. I completely understand the attraction that larger gear has. My disc is 12' wide, and it takes me 25 hours of tractor time to do one pass over this field. My seeder is only 10' wide, at with 50 acres * 45 minutes per acre, that's 37.5 hours of tractor time to seed it. I'm a little afraid of going too fast with the seeder; figuring that it's better to go slow and not break something than it is to save a couple of hours. The seeder does a good job of applying two different kinds of seeds (with very different shapes and sizes) in one pass. I'm putting down 15lbs of alfalfa and 15lbs of grass seed per acre. One reason that I spent the time to test and calibrate the seeder is that seed is expensive. The alfalfa is $3.75/lb and the grass seed is around $2.50/lb -- so a 50 lb sack of alfalfa seed is nearly $200! So the seed that I'm putting down is approximately $94 per acre. That seems like a lot, but I'm hoping to get 3 to 5 years of use out of it, which makes the price a little more reasonable... but it's worth being precise on the seeding. 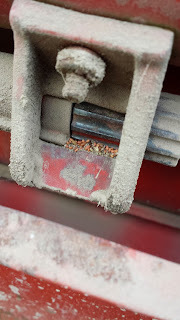 The tiny seeds are doled out by a little gear that is set into the bottom of the seeder; it spins as the main rollers move, so the faster you move forward, the faster the seeds are distributed. The grass seed dispenser is a set of holes in the bottom of the seed bin and a spinning whisk that fluffs the seeds up and keeps them from getting caked up. 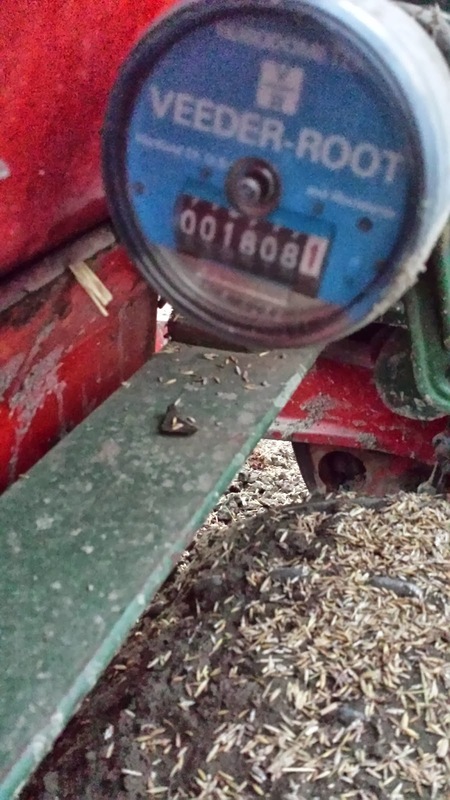 The alfalfa seeder tends to go out of adjustment after 10 or 15 acres; the big nut that keeps it firm isn't holding, so I have to check it every couple of acres. I don't want to spend any more on alfalfa than I mean to. So the basic routine is to fill all of the bins, check the outlets, and then run the seeder for a while; usually a couple of acres. 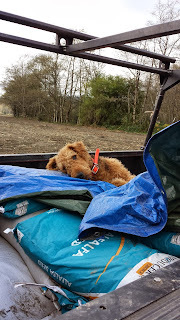 Then you stop, get out and look at everything to make sure it's all in working order and there's plenty of seeds, refill anything that needs it and then pull it another couple of acres. The crimping wheels leave a pretty clear mark on the disc'd ground, so it's easy to keep track of where I have and haven't been. Every 5 acres or so I make a note about where I am in the field, and change something. Increase the alfalfa setting, decrease it, increase grass, change to a different mix of grass, or omit the grass completely to have a pure-alfalfa field. That's the experiment part of this. Next year i'll look at each of these areas with the notes I'm making now and figure out what worked best; how many pounds and what kind of seeds get what results. My dog red watches me work on this stuff; he's been observing for a week now. He's not sure what I'm doing but any excuse for a truck ride is ok with him. And a good chance for a dog nap. So I've had a special relationship with my neighbor to the east, Dale. She's the ex-wife of the fellow who used to own this property; she apparently divorced him a few years ago, and apparently ended up with a 10 acre parcel cut off the main farm and a mobile home, that she lives in now. My impression is that she is extremely bitter about something. Since we're strangers, I'm not sure what it is, but I'm pretty sure that it's not something I did. So the issue today was that I had a pregnant sow that was apparently looking for a place to have her pigs. This little pig (she's about 250lbs) slipped under the fence between our properties, and made herself at home in the long grass. Dale doesn't really do much with her acreage, and as a result, there's long grass everywhere. This little pig was on her side for probably 2 hours or so before I got a call from the local animal control officer. Dale had called animal control to demand that they come and confiscate the pig. Now this is a little odd because I was working, have been working, about 100' from her front door, at the fenceline. She could have said "hey, this pig is over here" from her front door, but nope, she's calling animal control and demanding that they come and take the pig. Now a little background: Dale used to be married to a dairy operator. She knows that animals get loose, and she spent more than a decade dealing with her then-husband and animals. So if anyone understands livestock and rural, I'd expect dale to. So I go over to her front door, and she comes out to meet me, and I explain that I"m here to get the pig. She's called to have it removed, I'm here. No problem, right? Here's her reaction, which I recorded on my cell phone because i was having a hard time understanding it, too. I'm finishing up the planting of various things in the field; I'm plating two different pasture mixes, some alfalfa, per the local agricultural college's recommendation and some clover. Grass seed is expensive; about $2/lb, and alfalfa seed is even more so; $3.75-$4.50 a lb, in 50lb quantities. a 50 pound sack of alalfa seed is $200! 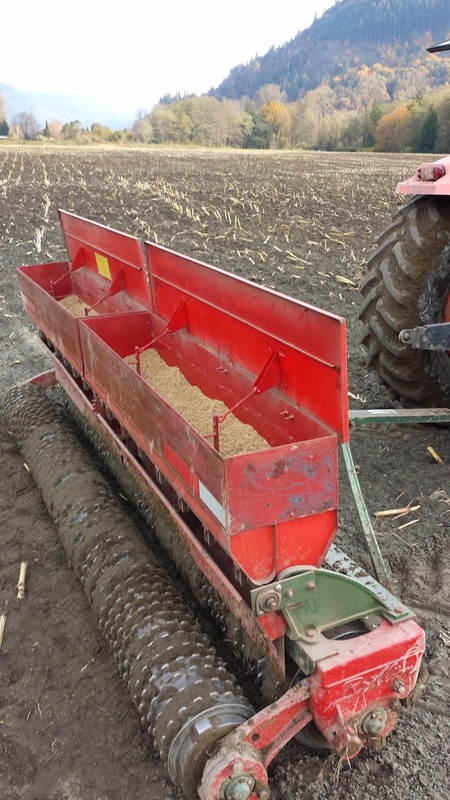 The seeding rates, the amount of seed that you put down per acre, is between 15 and 20lbs of seeds, and it varies a little based on what you're planting, and to do a proper job I basically decided that I needed a seeder. I found a used brillion 1201 sure-stand seeder that is basically two seed boxes (one for very small seeds, and the other for small seeds), with two compactor wheels below. As the wheels turn they turn a gear that moves an agitator in the seed boxes and a little wheel in the very small seed box. 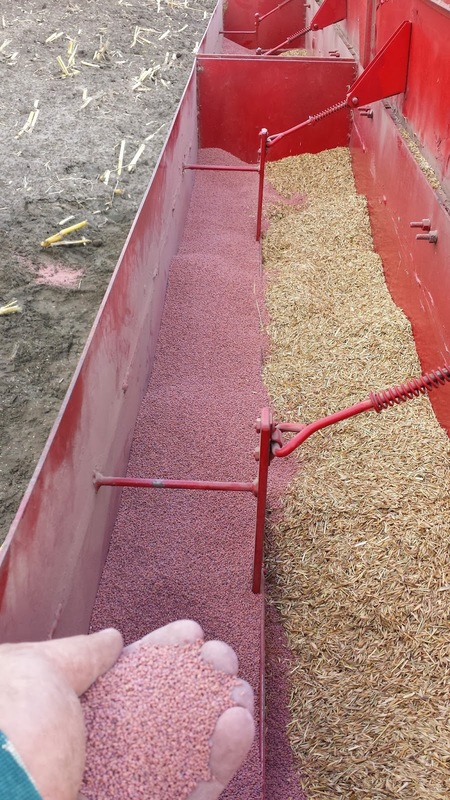 You can adjust the amount of seed that is deposited out of each seed box seperately, which allows you to plant different varieties of seeds; say grass and alfalfa, and do that in one pass. The seed box holds about 200lbs of seeds, which at 20lbs/acre is about 10 acres worth. The manual says that you can calibrate it by putting a wrench on the sprocket and turning it 276 times and then weighing the seed that comes out, or you can wrap a tarp around it and then pull it 336' (1/10th of an acre on this model) and then weigh the seeds and multiply by ten. 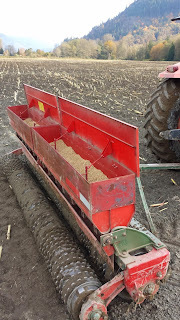 Since the pasture mix is a variety of seed sizes, and I'm not sure how well this device is calibrated to begin with, and because seeds are expensive I spent the better part of day cleaning, setting and testing the seeding rates. I would fill it with grass seed, drag is 336', weigh the seed in the tarp, adjust, and then drag it another 336'. To make this easier I just measured out the course and I'd go back and forth on it. I'm glad that I did. 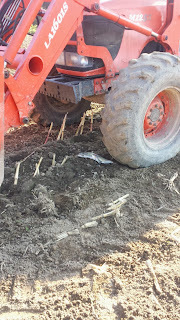 About 1/3rd of the seed holes were blocked, which meant that if I'd just run it in the field I'd either have bare spots or have to do two passes. 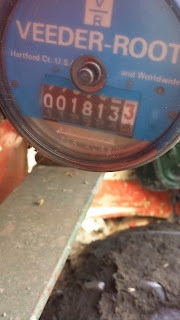 Since I've got more than 60 acres to seed, and it takes 25 hours per pass, two passes are out of the question. I can really see why bigger is better when you're dealing with anything over 5 acres. 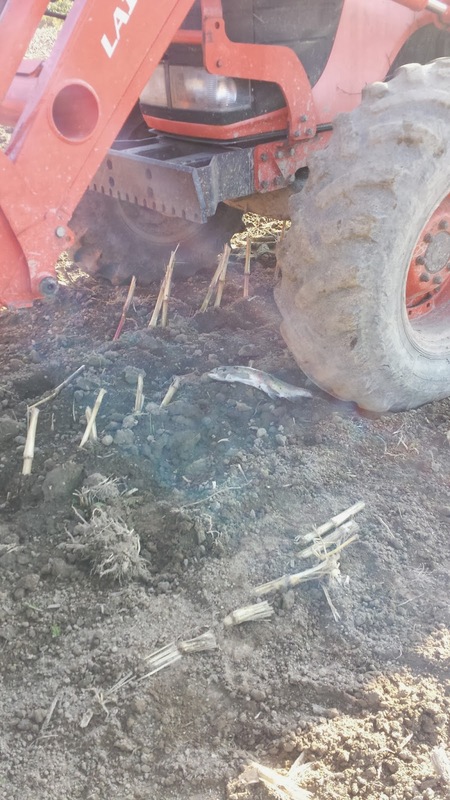 Just disking the fields to prepare the seedbed took two 12 hour tractor days. Quite a bit of work. Good chance to catch up with the audio books, and seriously think about a bigger disk. Now that I've got a feel for the calibration and settings, I can change them a little each time I refill the seed box - and with careful notes, sometime next summer i'll have a pretty good idea of what mix of what plants does best. Not meant to be a swimming pool. 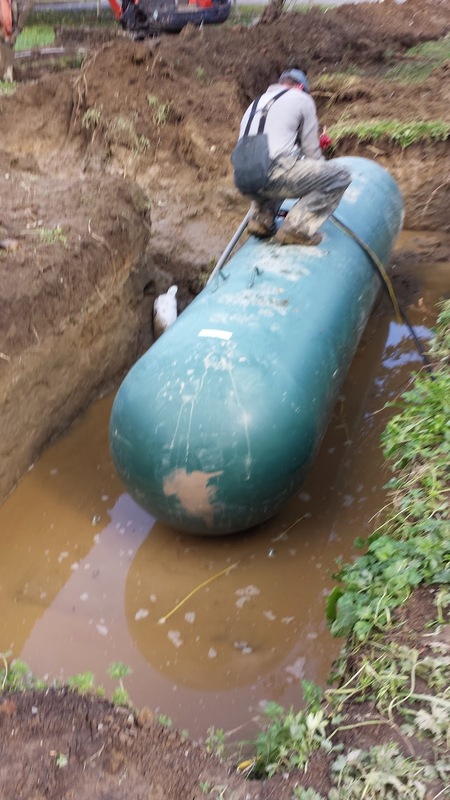 The house is set up with propane heat, and the previous owners had installed a new tank every time they put in a new heater. 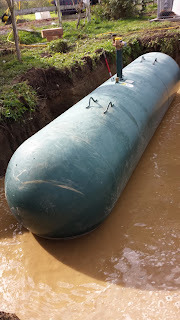 There were at least 4 propane tanks scattered around, and all of the tanks were owned by the supplying propane company. When he cancelled their service, they took all the tanks. 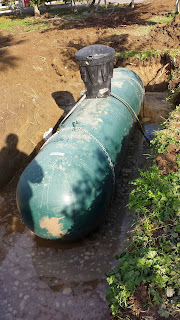 The propane companies around here offer a discount off the per-gallon rate if you buy a lot of propane at a time, and they offer a much cheaper rate if you own your tank. So I did the math and figured out that this tank would pay for itself in a few years, and ordered a 1000 gallon buried tank. I dug the hole for the tank (20' x 4' x 6') on thursday, poured a concrete slab into the bottom of it and installed eye bolts to attach the tank to the slab, so that the tank doesn't float away in case of flood, and the concrete cured over the weekend. monday I removed the form boards and dug the ditches that the gas supply lines would go into, and went to bed. I was woken later that night by thunder, but didn't think much of it. Well, I should have. we got 2.5" of rain that night, and it filled the hole and the ditches, so that when I got up tuesday morning I had a problem, and the tank was on the way. 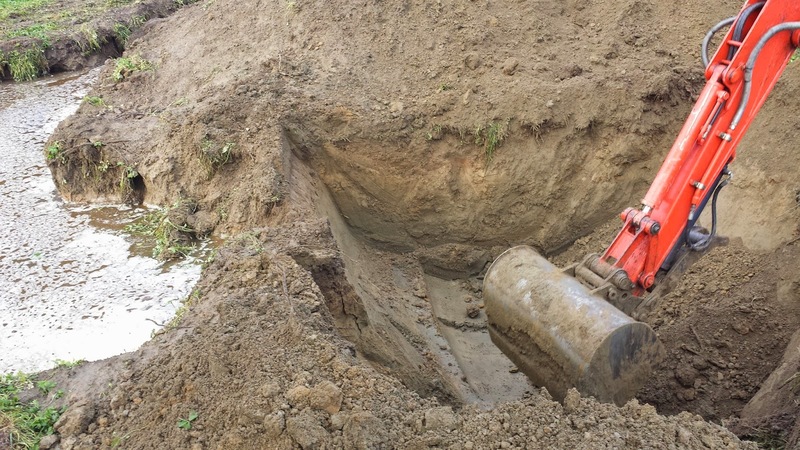 So I dug another hole about the same size, hoping to drain enough water to allow the tank to be set, but no luck. 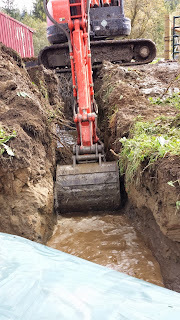 I ended up digging a ditch about 30' long to a lower area. Once dug, the water drained in 20 minutes, and when it was low enough the tank was set into the hole. The chains are connected to eye bolts in the 6" concrete slab underneath the water. This tank is sized to allow the house to run its furnace and water heaters for 21 days. I'll probably install a small propane-fired generator to run the basic house utilities -- water pump, some outlets, refrigerator/freezer, that sort of stuff. That'll reduce the run time to a week or so. This is really a creature-comfort thing for me. This is an area that is prone to relatively-long power outages; I'd like them to be a nuisance, not an emergency. One more thing I can check off the list. Pictures off of my blog show up in all sorts of places to illustrate peoples point about something they're writing about. If you're going to use a picture, asking permission of the copyright owner is appropriate, and most people ask that you put a link back to the origin with a photo credit. Something like "photo courtesy of blog.bigpig.net" with a clickable link is fine. "the incubator", who has a stated mission of "hatching conversations about science, uses my picture in an essay on dry pork chops and parasites. Link to the article here. No credit. My pigs are used in political discourse, as well. Link here. The kosher ominvores quest uses my pig picture. Of all the places I'd have expected to see my pigs show up, it's not on a kosher web site. Link here. Snowball the pig... well, I'm not sure what this is. but here's the link. More political use of the picture, related to the boston bombing suspect. Link here. Happiness and capitalism "if only I had THAT, I'd be happy", link here. The new farm has 1/2 mile of frontage on the north fork of the stilliguamish river; I believe that the river hosts a run of every kind of salmon found in washington state. 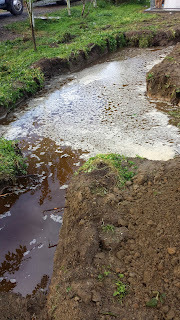 Most of the time it's a clear, cold, fast-running river with a cobbled bottom; occasionally it floods, but its drainage area isn't that big, so the wateer comes up, and then goes down, usually in a few hours. It can flood pretty dramatically during those hours, though; river levels vary by as much as 20 feet vertical. This is an odd-numbered year; that means that we get a pink salmon run in addition to the other species. Pinks are prolific and have strong runs. 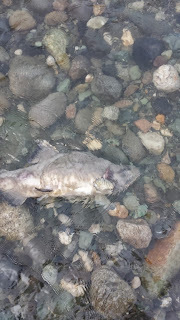 right now theres tens of thousands of them in the river, making redds, guarding them and then dying. 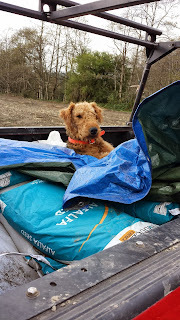 They can see pretty well, and they will see me as I work along the river with my tractor, and out of deference to them I try to keep my activities to a minimum; they have a finite amount of energy to get their breeding done, and it's been several weeks or a month since they last ate. They are very serious about this task. There are thousands of dead salmon up and down the river; so many that all of the local bird species are stuffed; they cannot eat any more salmon. 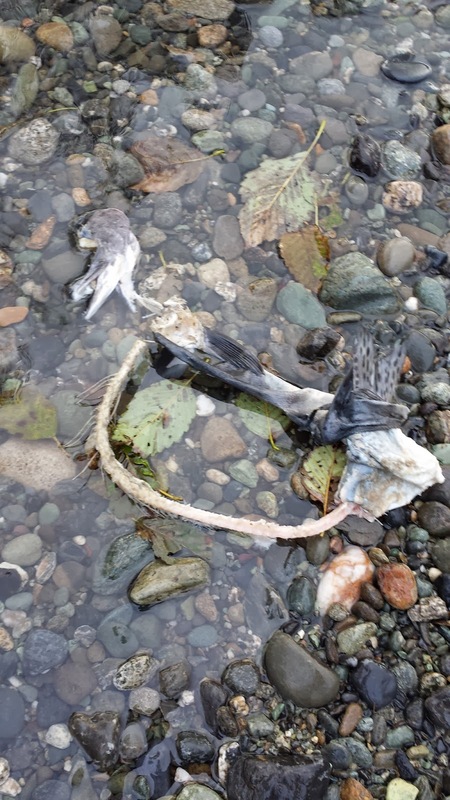 Ducks, geese, crows, ravens, hawks and all manner of small predators share the bounty of the salmon run. The pinks will all die in the next couple of weeks, and their fry will hatch and travel down to the sea, also to return on an odd-numbered year. This is a picture from an interesting article on corn in the US. I'm looking carefully at corn, all sorts of corn, because I really do like it as a forage crop, as winter feed for dairy cows, for instance. But it only makes sense if I can grow it myself, and organically. My take-home lesson from this article is that GMO corn is very, very popular. But even though over 90% of the corn planted in the US these days is GMO, the yield-per-acre of that corn hasn't risen. From 2000 to 2012 there has been a small increase, but you'd expect there to be a dramatic increase, as we went from 20% gmo in 2000 to 90% GMO in 2012. Nope. That says to me that the GMO-herbicide treadmill is good for the companies that produce the seed and herbicides, but not so good for the farmer. 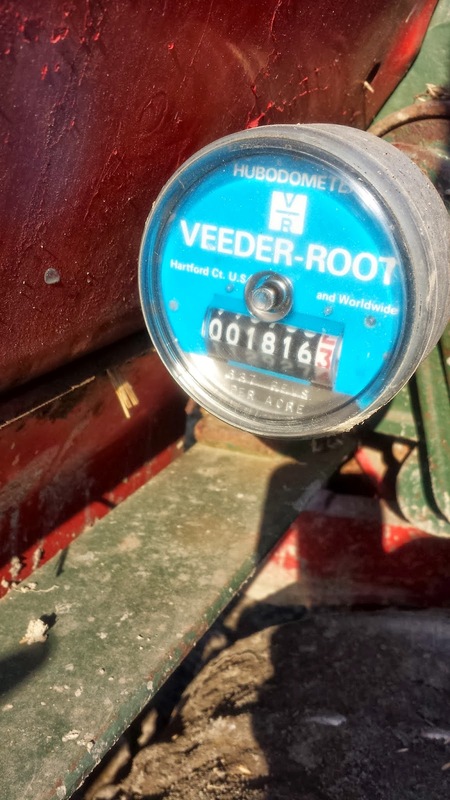 You pay more for all of that stuff, so your costs are higher, but your yields aren't. Seems pretty clear that skipping that whole program in favor of some sort of tillage approach is the right path to take. If you want to read the whole article, go here.